APRIL SPECIAL- From $ 2995----Large 2BD Villa- Salt Water Pool & Putting Green! Built in 1961, classic Alexander Styling with hints of Frank Lloyd Wright design, make these villas extremely popular . They have undergone several renovations. The classic feel of the property reminds many of the bygone days of Frank Sinatra and Dinah Shore. All Villas have updated plumbing, heating and air conditioning. New French doors open to the courtyard in the two Bedroom Villa, Sliding patio doors for the single one bedroom Villa. All furniture is new, with premium mattresses. Two bedroom Villa: One bedroom has a king bed, the other a queen bed. One Bedroom has carpet, the other Mexican tile/area rugs. All rooms have vertical blinds or curtains, and all bedrooms have entrances to the courtyard. The two bedroom villa also includes a private putting green. One bedroom Villa: Has a king bed. Both Villas have queen sofa beds as well. Amenities include 42' TV in Living Room, DVD player, Stereo/radio CD player. DVD Movies/Books/ and CD's are provided. Bicycles (2) provided for guest's enjoyment. These two Villas share a courtyard that is desert landscaped with a (OPTIONALLY) heated pool and several patio areas with lounges. The pool was recently remodeled. A new natural gas Bar-B-Que is also provided and western/sunset views of the mountains give a relaxing feel when viewed from the patio areas. A large outdoor dining table is part of the two bedroom Villa, a smaller outdoor table that seats four is provided for the one bedroom Villa. Kitchens include refrigerator,dishwasher, gas or electric stove, garbage disposal, microwave, coffee machine, as well as general cooking supplies, glassware, utensils, and place settings for four (4)-one bedroom or (6)- two bedroom. A washer and dryer are onsite, as well as iron, and vacuum. Cleaning/basic maid service referral can also be made upon request. Linens, towels etc. are all provided. Golf courses, art galleries, supermarkets and Living Desert botanical garden are just minutes away. - Minimum Rental 28 days. * Special for 4 months or longer. Our desert getaway is named after Sedona...she was the inspiration for our property. True character of the desert with modern amenities, and a wonderful location. The courtyard is the perfect place to relax, whether reading a book, watching the birds, enjoying the morning sun, or sipping a drink sitting by the firepit at twilight. Each Villa has a 'His' and Her' bathroom. Each unit also has a desk for laptops or work, DSL hardwire connection is also available with wi-fi. Ready to go with all typical items required to make dinner or entertain friends. both the one bedroom and two bedroom vill have indoor dining tables, as well as dedicated tables outside on the patio. Each villa has their own outdoor table. Flat Screen w/ Blue Ray DVD player. Bose Stereo system in each villa. 2 new bicycles are provided on property for guests use at no additional charge. 2 Bedroom unit has private putting green. Located offsite, the courts at Indian Wells tennis garden is 10 minutes away. Salt Water, may be heated to 80 degrees(Nov-April)( Inquire about surcharge). Shared between only 2 villas. Quiet location, Tastefully furnished with quality furniture (NO glass & Brass here), Local Phone, Stereo/CD Player, Heated Pool, Fireplace in 2Bdrm, Sorry NO Pets, Bicycles (2). Putting Green for 2 Bdrm Villa. ** - Gas Firepit in courtyard. What more could you want when this had everything! We would definitely recommend the listing but don't expect a modern up to date unit! in short-Great house,Great hosts, and above all else close to everything. We had regular pool maintenance and it was always crystal clear,.The landscapers came every week and we didn't even put out the garbage on collection day as that was taken care of! Thank you for your review. We are so happy to hear you enjoyed your stay at Sedonavillas in Palm Desert. Chris, your wife Pam, and your friends are welcome anytime. As property owners, we appreciate how you and your fellow guests truly cared for the property as if it was your own. We try hard to make sure the villas, courtyard, and pool area really help a guest relax, enjoy the desert lifestyle, and take advantage of the location and all Palm Desert has to offer. So thats very nice to hear. Our property offers the best of both worlds...mid-century character and a relaxed atmosphere, with the updated plumbing, air conditioning, SAT-TV and Wi-fi expected by today's travelers..
We are glad you enjoyed your vacation, and look forward to having you as our guests again in the future. The villa is a very nice little home and has many very positive features, such as the swimming pool right outside the door, the great patio/backyard area with the many trees and shrubs, BBQ grill, and lounge furniture and tables and chairs. The villa is very comfortable and well furnished. The location is excellent and close to many special feature of Palm Desert; especially El Paseo area of shops and restaurants representing a wide range of ethnic foods. We thoroughly enjoyed our stay at the villa. A perfect spot for a winter get a way. Lovely courtyard with pool just steps from your door. Patios have up to date furniture and seating area with fireplace and barbecue. The location is perfect with the shops of El Paseo close by and lots of novel grocery stores. This would be an ideal place for several groups to stay as there are 2 units so you can do things together or be private when you wish. The owners are a pleasure to deal with and make every effort to make your stay enjoyable. 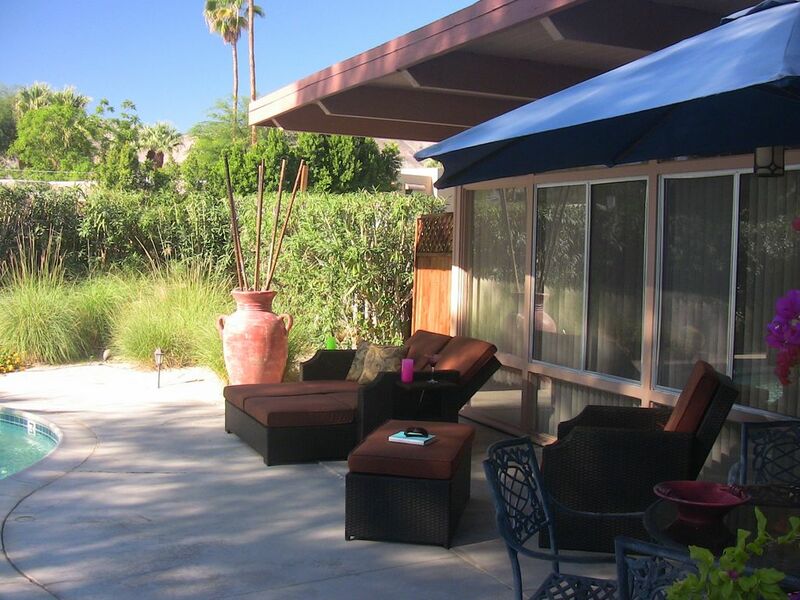 The villa in Palm Desert was wonderfully located, within walking distance to restaurants, grocery stores and shops. The two bedroom villa has a homey feel with a well equipped kitchen, gas fireplace and bbq. The pool area, which is shared with another unit, is nicely landscaped with desert plants, comfortable seating and a warm fire pit. It was a wonderful place for the perfect get-away . We spent a month and it was a great place to stay. The location is very convenient. The pool courtyard is fabulous. Sun, relaxation, and a wee bit of exercise.! This is a lovely character home - lots of Spanish flair - divided into 2 units ( one 1 bedroom unit ...and one 2 bedroom ) both have 2 bathrooms ..lots of space ..you won't feel crowded and very private..Patio with garden furniture for each unit..BBQ and fire pit in the garden area'......The beds were high quality ...very comfortable.The full kitchen is well stocked..I chose the location as it is walkable to El Paseo ~ a beautiful street of shops of mixed price range ...Anthropologies to Louis Vuitton ! !~ and a short drive further is Westfield mall with Macy's and more affordable shopping. I would not hesitate to recommend the home to family or friends.....only hope we can rent it again ourselves.....!!! Cheers !? ? ? ? Hiking- Nearby trails await those at any level, Championship Golf- Some of the finest public course in the US, Tennis - Public courts are 5 mins, away, or visit the Indio Wells Tennis Center, Nearby Gym - The Palm Desert Civic center is only minutes away, Wildlife Viewing - The Living Desert is full of desert creatures and zoo animals, Shopping - Tiffany to Tommy Bahamas, Saks to Talbots you name it!, Dining - Both Elegant & Casual Restaurants, Other Sightseeing, Nearby Windmill Tours, and best of alll you are 10 Minutes from the new RIVER complex with theaters and additional dining, CASINOS -10 minutes away from World Class casino gambling & entertainment, CENTRALLY LOCATED, Sedonavillas in Palm Desert is the best place to stay for both relaxation and activity, it's like staying at YOUR 2nd home! $3795 Standard Rate is for the 1 Bedroom/2Bath Villa. 2 Bedroom villa is slightly more. This Cochella-Stagecoach Rate is for BOTH villas, complete "2 Villa" COMPLEX - SLEEPS 6. Non-refundable Cleaning fee $275. Refundable SECURITY DEPOSIT of $1000 due with final payment. Call to book today!